Continuing the story of how Maurice Toon ended up on New York's Long Island. Read (part one) here, and (part two) here. Alfred Toon arrived in Philadelphia in 1851, and in 1854, married Anna Strowhauer (born 1836 in Pennsylvania). They lived in Philadelphia until at least 1870; in 1860, they were living somewhere in Philadelphia's 19th ward, an area bounded by Lehigh Avenue to the north, Germantown Avenue and 6th Street to the west, Oxford Street and Frankford Avenue to the south, and the Aramingo Canal to the east: the area around Norris Square. There's a good map of the area here, from a little later, in 1874. Click into any of the sections to see details of the streets, to get an idea of how the streets were; streets and streets of Philadelphia's row (terraced) houses, all new. Norris Square itself was designed in 1859. Another example: Rocky's house was 1818 East Tusculum Street, Philadelphia, though I believe Rocky's house was built a few decades later. Alfred became a US Citizen on 26th September, 1860, four years after signing a declaration of intent (you had to sign the declaration before you could apply for citizenship until 1952). But... the very next year saw the start of the American Civil War. Alfred and Anna's daughter Selina was born on Christmas Day, 1859, and their second daughter, Lizzie, arrived on 5 Feb 1862. But it wasn't long before Alfred had to go off to war, leaving the young family behind. 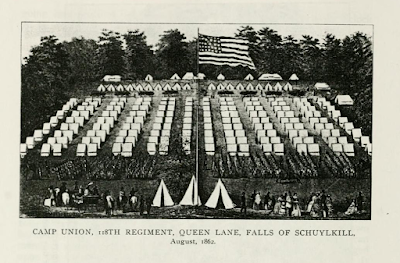 Alfred Toon joined the Union Pennsylvania Volunteers, 118th Regiment, Pennsylvania Infantry, on 7th August, 1862. He served as a Private for his time in the military; I don't know exactly where Alfred fought, and haven't yet confirmed when he left the military, but this page lists the places where the 118th was. Antietam, Shepherdstown, Fredricksburg... Gettysburg, and more. 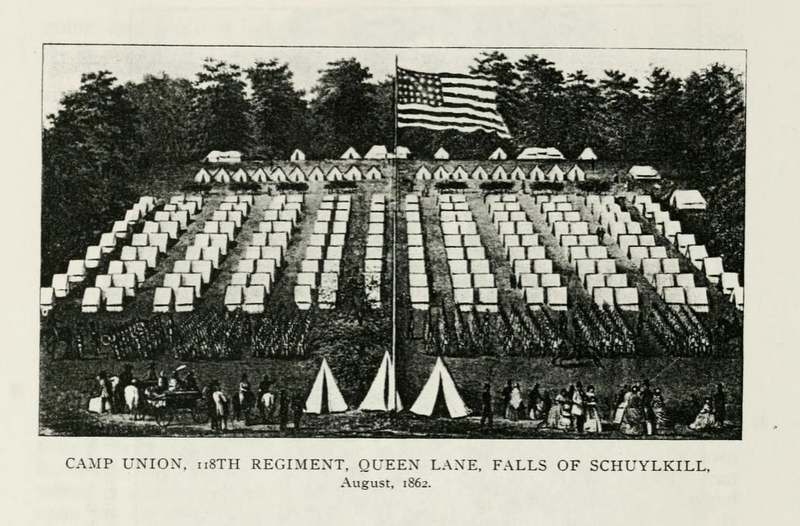 The regiment lost a total of 253 men and officers during the war: half to battle injuries, half to disease. Which gives an idea of the kind of situations they were living in. Our Alfred, he made it home (or there wouldn't be a Maurice-on-Long-Island to talk about). He and Anna had at least four more children: a little Alfred, in 1867, followed by Harry, Maria, and William. In 1872, the family moved to Sellersville, Bucks, Pennsylvania and Alfred had started his hosiery business: in 1880, they were living on Main Street, Sellersville, with Alfred running a "woollen jacket" factory. Alfred (I wonder if they called him Alf?) died in 1903, aged 71. He is buried in the Sellersville Cemetery, a Civil War Veteran star next to his grave. Anna joined him there, in 1906. Maurice? His story is coming next, in part three: son and grandson of an Alfred!